From the 1st century BC to the 2nd century AD: an artisanal area was already settled in the plain to the east of Dambach-la-Ville. In the past, a part of the commune of Dambach-la-Ville that extended on several dozens of hectares was dedicated to the making of ceramics and roof tiles. 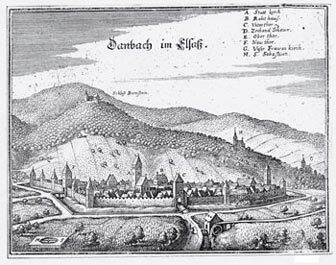 In the Gallo-Roman period, what would later become Dambach-La-Ville, was already a domain whose existence is testified by the ending in -acum (Tambacum). Tambacum was given to the church of Strasbourg around 1029. The bishop of Strasbourg then decided to make it a stronghold, on the basis of attacking of the lordship of Bernstein, his rival. As early as the middle of the 12th century, it gathered together the inhabitants of the surrounding villages behind ramparts built on this occasion: it is known as the “enchâtellement”. The bishop succeeded in conquering the castle of Bernstein “the stone of the bear” in 1227. The ramparts were gradually enlarged and their current plan dates from 1323, which is proved by the date of laying of the first stone on the arch in Sandstone of the keep-tower in the east: the gate of Ebersheim. Its stone enclosure with its 3 doors and its ditches witnessed the siege of the Armagnacs led by the man who would become Louis XI, the Peasants war and the passage of Swedish during the Thirty Years War. At that time, the city was divided into 6 districts, each of which was led by a Burgermeister (mayor), who were each under the orders of the bishop’s representative. Thus, in the old bylaws of the city of 1364 and 1562, a large part is dedicated to the organisation of the vine and wine trades, and above all to the sale of the wine which was, and remains, Local economy. Among this community there were also coopers who were an important corporation. In addition to making the barrels, they assisted the winemakers with the winemaking process. When a buyer arrived from outside with his horses and carriage, the cooper used to ring the bell so that the winegrowers would return from the vines. Alongside the wine brokers, the winegrowers made the most of the situation and took this opportunity to tell the legend of the village, according to which a bear would have found the first grapes in the neighbouring forest. On this occasion, vine began to be planted and the bear became Dambach-la-Ville’s symbol. As you will have undoubtedly understood; the numerous conflicts to retain this stronghold of Alsace did not happen coincidentally. 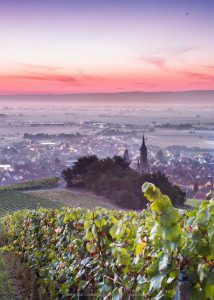 Ideally set in the heart of Alsace and the Piedmont of the Vosges, Dambach-la-ville is a favourable site for vine culture. Situated in the middle of the natural barrier that is constituted by the Vosges and the Black Forest, the village is protected from oceanic rainfall and gets plenty of sunshine at the time of grapes ripening. At the core of important points of interest, Dambach-la-Ville is encompassed between the walls of its fortified enclosure, a place of history and tradition. It will seduce you with its winding alleys lined with old half-timbered houses. The whole vineyard above the village is made of a granitic terroir. 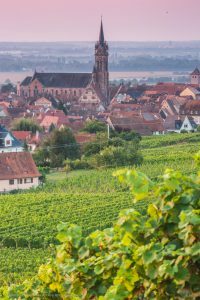 It is located at the level of the downthrow fault of the Rhine ditch and is one of the largest wine-growing communes in Alsace (over 450 ha of vines, 56 ha of which are classified as Grand Cru Frankstein). Throughout your visit you will find shops, restaurants, accommodation and a wine trail that will teach you about the fauna, the flora and the various grape varieties planted around our village.